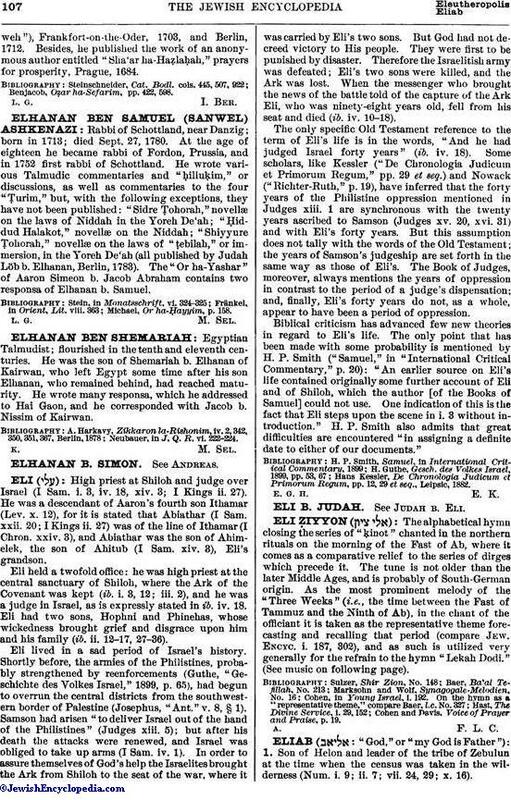 High priest at Shiloh and judge over Israel (I Sam. i. 3, iv. 18, xiv. 3; I Kings ii. 27). He was a descendant of Aaron's fourth son Ithamar (Lev. x. 12), for it is stated that Abiathar (I Sam. xxii. 20; I Kings ii. 27) was of the line of Ithamar (I Chron. xxiv. 3), and Abiathar was the son of Ahimelek, the son of Ahitub (I Sam. xiv. 3), Eli's grandson. Eli held a twofold office: he was high priest at the central sanctuary of Shiloh, where the Ark of the Covenant was kept (ib. i. 3, 12; iii. 2), and he was a judge in Israel, as is expressly stated in ib. iv. 18. Eli had two sons, Hophni and Phinehas, whose wickedness brought grief and disgrace upon him and his family (ib. ii. 12-17, 27-36). Eli lived in a sad period of Israel's history. Shortly before, the armies of the Philistines, probably strengthened by reenforcements (Guthe, "Geschichte des Volkes Israel," 1899, p. 65), had begun to overrun the central districts from the south western border of Palestine (Josephus, "Ant." v. 8, § 1). Samson had arisen, "to deliver Israel out of the hand of the Philistines" (Judges xiii. 5); but after his death the attacks were renewed, and Israel was obliged to take up arms (I Sam. iv. 1). In order to assure themselves of God's help the Israelites brought the Ark from Shiloh to the seat of the war, where it was carried by Eli's two sons. But God had not decreed victory to His people. They were first to be punished by disaster. Therefore the Israelitish army was defeated; Eli's two sons were killed, and the Ark was lost. When the messenger who brought the news of the battle told of the capture of the Ark Eli, who was ninety-eight years old, fell from his seat and died (ib. iv. 10-18). The only specific Old Testament reference to the term of Eli's life is in the words, "And he had judged Israel forty years" (ib. iv. 18). Some scholars, like Kessler ("De Chronologia Judicum et Primorum Regum," pp. 29 et seq.) and Nowack ("Richter-Ruth," p. 19), have inferred that the forty years of the Philistine oppression mentioned in Judges xiii. 1 are synchronous with the twenty years ascribed to Samson (Judges xv. 20, xvi. 31) and with Eli's forty years. But this assumption does not tally with the words of the Old Testament; the years of Samson's judgeship are set forth in the same way as those of Eli's. The Book of Judges, moreover, always mentions the years of oppression in contrast to the period of a judge's dispensation; and, finally, Eli's forty years do not, as a whole, appear to have been a period of oppression. Biblical criticism has advanced few new theories in regard to Eli's life. The only point that has been made with some probability is mentioned by H. P. Smith ("Samuel," in "International Critical Commentary," p. 20): "An earlier source on Eli's life contained originally some further account of Eli and of Shiloh, which the author [of the Books of Samuel] could not use. One indication of this is the fact that Eli steps upon the scene in i. 3 without introduction." H. P. Smith also admits that great difficulties are encountered "in assigning a definite date to either of our documents." Hans Kessler, De Chronologia Judicum et Primorum Regum, pp. 12, 29 et seq., Leipsic, 1882.